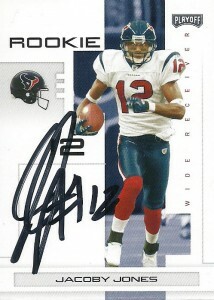 Jacoby Jones was drafted by the Houston Texans out of tiny Lane College (Jackson, Tn) in the 3rd round of the 2007 NFL draft. A track and field beast in college, Jones is a dangerous threat every time he touches the ball and was immediately penciled in (replacing Jerome Mathis) as the punt and kick returner and as an intriguing wide receiver project. Many fun stories surround the young Jones, and fellow wide receiver David Anderson has called himself Jones’ interpreter. Hopes were high riding into 2010 that after Jacoby’s 2009 performance, he would be ready to take over opposite Andre Johnson, but still lacks the proper hand-eye coordination and has dropped some easy balls. Otherwise Jakespeare has a great combination of size and speed and is a genuine playmaker. Many of my friends had Jones targeted as an upcoming fantasy football stud, but I disagreed with Kevin Walter still in the fold. Still, Jacoby remains a speedy return man that all teams must account for at all times when he is on the field.